In everyday speech, the term ‘person’ often means roughly the same thing as ‘human,’ which in turn refers to someone who belongs to the species Homo sapiens. However, in practical ethics and in philosophy more broadly, the term ‘person’ has a much more rich, and more complicated, history. In the West, philosophers have often used the term ‘person’ to denote a set of capacities that imply both (A) the ability to engage in certain sophisticated behaviors and (B) an elevated moral standing deserving of certain protections. Personhood in the philosophical sense has been suggested to be related to as diverse a group of characteristics as the ability to remember the past and plan for the future, a sense of self, a narrative conception of one’s life, the use of a natural language, participation in a moral community, and many other suggestions too numerous to list here. And ‘being a person’ is often thought to imply that one is due strong moral protections. Some authors have suggested that personhood is the criterion required to have any moral standing at all, and others have claimed that persons have rights that go above and beyond the moral considerations that are due to “merely sentient” beings who are not persons. As such, in philosophical lingo, “being human” generally is no longer considered a necessary nor a sufficient condition for being a person. Frodo Baggins or Wonder Woman, for example, would seem to possess the same rights and responsibilities as most humans regardless of how closely their DNA aligns with our own. Hopefully no one would think that it’s permissible to cause harm to hobbits or Amazonians made out of clay simply because they are not technically Homo sapiens! And it’s not just a physical resemblance to humans that matters; ET and Neytiri from Avatar would be persons on any respectable philosophical definition. Conversely, and perhaps more controversially, on some philosophers’ definitions of personhood, there may also be some humans who are not persons. If you held that a narrative conception of self is a requirement for being a person, for example, then many humans (including young children) would not fit the bill. 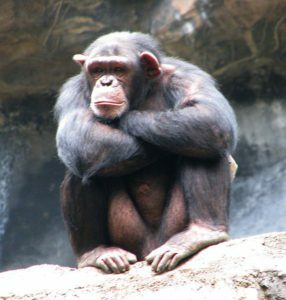 So if you ask a philosopher, “is a chimpanzee a person?”, you might expect to get the familiar (and possibly slightly annoying) answer, “well, that depends on what you mean by person.” And the philosopher might further be tempted to introduce new terminology, such as “sentient nonpersons” or “near persons” that would allow for a more precise way of dividing up different categories than simply dividing the world into “persons” and “nonpersons.” After all, it certainly would be a mistake to start a discussion about morality with an assumption that those are the only two possible morally relevant categories. Unfortunately, however, when it comes to legal rights, the current debate about personhood does not allow for the type of free-ranging search for definitions, subcategories, and nuance that many philosophers would prefer in being asked to define ‘personhood.’ The law in the U.S. and many other countries divides the world into two categories: “persons” and “things.” Persons have legal rights. Things have none. The is part of the explanation for the much-maligned notion of “corporate personhood” in the United States…essentially judges decided that personhood status was required to provide corporations with certain legal protections. Right now, all animals are treated as “things” by U.S. law and as such have no legal rights. In many places, if someone accidentally kills your companion animal, that is the legal equivalent of them accidentally breaking your lamp (though there are, of course, certain laws banning types of animal cruelty). It is against this background that a recent motion was filed in New York State arguing that two chimpanzees, Tommy and Kiko, should be released from captivity into a protective sanctuary based on the common law writ of habeas corpus. Habeas corpus rights only apply to persons. Though I played only an extremely minor role and have my own somewhat orthogonal views that I hope to spell out on this blog at a later date, I was very proud to be part of a group of 17 philosophers who submitted an amicus brief to the court offering our support for the claim that Tommy and Kiko should be regarded as legal persons. Given what we know about the remarkable intelligence and rich emotional lives of chimpanzees, it seems clear that in choosing between saying they are “things” vs “persons,” the correct legal characterization is persons. Or so we argued! I encourage people to read the full brief and consider the argument themselves (but feel free to comment here). And for more analysis on the topic, please see this post by Andrew Fenton and L. Syd Johnson, two people (among many) who did excellent work on the amicus brief. 4 Responses to If You Had to Choose, Would You Say Chimpanzees Are Persons or Things? Super interesting. Just two things though. One is a request for clarification. You say: “all animals are treated as “things” by U.S. law and as such have no legal rights”. No rights at all? I’m surprised. So in the US you can beat up a dog or inflict unnecessary pain to a cat just for fun, and this would not violate any legal right of animals? Is that right? The other is more of a conceptual matter. You say that you support “the claim that Tommy and Kiko should be regarded as legal persons”. Legally the following would not make much difference, but philosophically it does: treating someone/something “as a” person is not the same as saying that it(she/he) “is” a person. For example, in the Catholic doctrine, a human embryo is not a person from conception, because the soul is not present from conception; however, the doctrine says that it should be treatead “as a person” (Congregation for the Doctrine of the Faith. Donum vitae). I was wondering whether your post points to an analogous conclution (of course leaving aside the metaphysical assumptions of the Catholic doctrine): that chimpanzees should be treated as persons,regardless of whether they in fact are persons. This thesis, it seems to me, would be less problematic to defend (unless you think that “being a person” and “having a right to life” mean exactly the same thing, in which case the idea that someone is a person would be equivalent to the idea that it/she/he should be treated as a person). In this way you may retain the idea that there is something distinctively human about being a person, while providing sufficient grounds for granting important rights, including the righ to life, to chimpanzee. Thanks for the great comments, Alberto! In regards to your first point, the explicit justification for animal cruelty laws is that they are intended to prevent sadistic behavior of humans…so they’re not formulated in a way that claims the animals themselves have rights. In regards to the second point, I think we have to distinguish between “moral personhood” of the type moral philosophers talk about and “legal personhood” of the type relevant for the law. From what I can tell, the debate about “moral personhood” is extremely messy and doesn’t really track the legal debate. So I wouldn’t want to claim that “chimpanzees are not legal persons but should be treated as such,” since I think they *are* legal persons. But you certainly could claim that on some accounts of moral personhood they are not persons but nevertheless should be treated as legal persons. Hello, thank you for sharing this piece. A moral person is both a moral (able to act morally) agent and a moral patient (able to bear morally relevant interests). I don’t see how non-human animals could act morally, but I can see how non-human animals could bear morally relevant interests. So is you claim that some non-human animals persons equivalent to the claim that they are bearers of morally relevant interests? If yes, then the claim seems a bit unoriginal, starting from Bentham’s discussion of animal suffering. If no, what in your view do non-human animals have that makes them more than moral patients, and why does this extra bit fall short of making them morally responsible, i.e. appropriate subjects of moral judgements? While I wholly support the goal, this Brief exaggerates the relevance of philosophical material to the legal questions at hand. Pace the Brief, the exclusion of non-human animals from full or equal membership in the community governed by law isn’t arbitrary at all—for every legal purpose imaginable it is quite simple to identify humans and distinguish them from other animals, including chimpanzees. We do not need to resolve the philosophical worries about species lines in order to be able to do this, nor is the ability to identify species typical traits of interest to the law challenged by Darwin. Nothing in evolutionary theory challenges our ability to identify formal education as beneficial to human children but not chimpanzees, the importance of voting rights to human but not chimpanzees, and so on. The three other arguments against chimpanzee personhood the Brief attempts to counter strike me as variations on the first, but a couple of comments are in order. Pace the Brief, the argument is not that entering into a social contract makes one a person; rather it’s that the ability to enter into a social contract is a necessary condition of personhood. That something depends on human attention for its livelihood, or enters into relationships with humans, does not suffice for membership in the community governed by New York laws, unless the philosophers mean to include house plants and pets. The arguments from autonomy strike me as the most compelling, but mostly in identifying important but often under appreciated ways in which chimpanzees can be harmed. This points to what I think is the better legal remedy: better animal welfare laws and better enforcement.